A very special tour, exclusive to the Rail Travel Tours group, was a visit to the Port of Churchill. This was a special treat for railfans. It's the northern terminus for the Hudson Bay Railway and the northernmost point of any Manitoba rail line. It's Canada's only arctic seaport, and it's one of the largest grain elevators in the province. The only reason for Churchill's existence was the port. The rail line was completed to Churchill in 1929, after it was decided that a rail line to Port Nelson wasn't feasible because of the heavy silt buildup from the Nelson River. Farmers using the port had the advantage of not paying charges laid by the Saint Lawrence Seaway, and the route from Churchill to Europe is much shorter than any other North American port. But the track was built on muskeg and permafrost, which limited the size of the rail cars, the length of the trains, and the speed which the trains could travel. Standard three bay hoppers carrying a full load of grain were just too heavy. The short shipping season also impaired grain traffic. For many years, the port was owned and operated by the Province of Manitoba. It was turned over to the federal government, who operated it for about a decade, until it was sold to OmniTRAX - for ten dollars! The port was almost entirely reliant on grain shipments from the Canadian Wheat Board, but grain traffic has decreased considerably at the port when the CWB's monopoly was ended. OmniTRAX purchased trackage north of The Pas from CN Rail to form the Hudson Bay Railway in 1997. Since then, they have been able to run heavier rail cars and longer trains, bringing increased business to the Port from various mines and pulp mills. Much thanks to Rail travel Tours, who provided us with this rare opportunity to visit this historic Manitoba railway site! 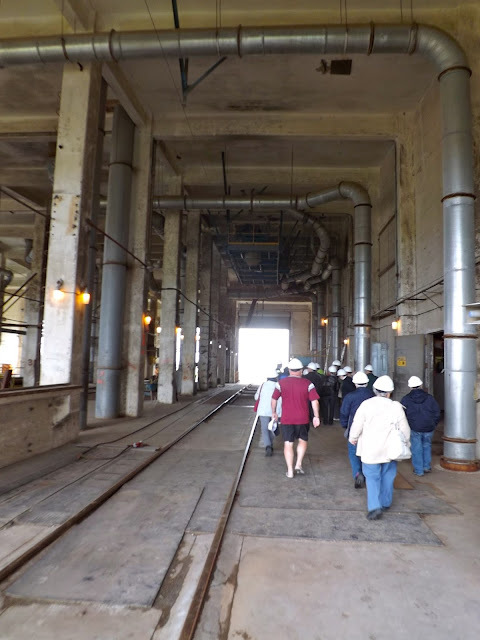 Our group tours the massive interior of the grain loading facility of the Port of Churchill. 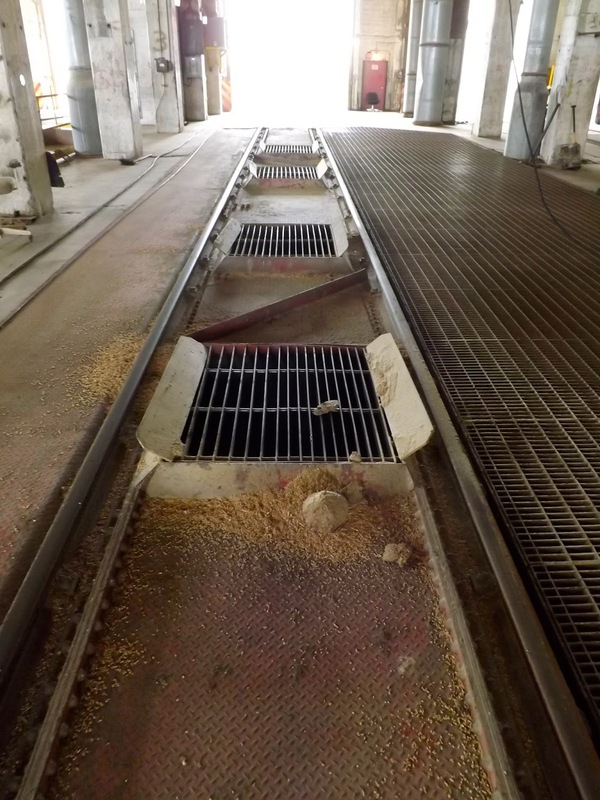 These grates are placed between the rails to empty the hoppers. The grain is then transported by conveyors to the many silos in the port. A representative from the Port of Churchill explains the process of grading grain to members of our tour group. The grain storage process is described by a Port of Churchill employee. See all of those circles drawn behind him on the slate? Each one of those circles is a grain bin at the port! That is a massive structure indeed. As you're our resident expert on Manitoba grain elevators, Steve, could you tell us if this is the biggest one in the province?